Brides to be can win wonderful prizes for their wedding day and make substantial savings from suppliers at Bride: The Wedding Show at Westpoint Exeter. Here’s a look at what’s up for grabs. Thomas Cook and AMResorts are offering an all-inclusive seven night luxury honeymoon to Secrets Maroma Beach Riviera Cancun. Visit the Archant stand for your chance to win. Aylin White Designs is giving away two hand-painted flower bags over the course of the show. The perfect accessory for your bridesmaids, maid of honour or flower girl, there is one bag being given away each day. Best Western The Dartmouth Hotel Golf and Spa is running a free prize draw for a spa break for two. Bizzie Baking is running a 10% discount on cakes for the first five brides who book, either at the show or after using the details provided. For bookings made at the show, Bodmin Jail is offering visitors a £500 discount on venue hire. Changing Faces is running a competition to win a MAC make-up voucher when you like the company’s Facebook page and follow on Instagram over the weekend. The winner will be announced on Monday, 9th October. Book with The Cowlick Creamery and receive a £10 discount (available on both days of the show). 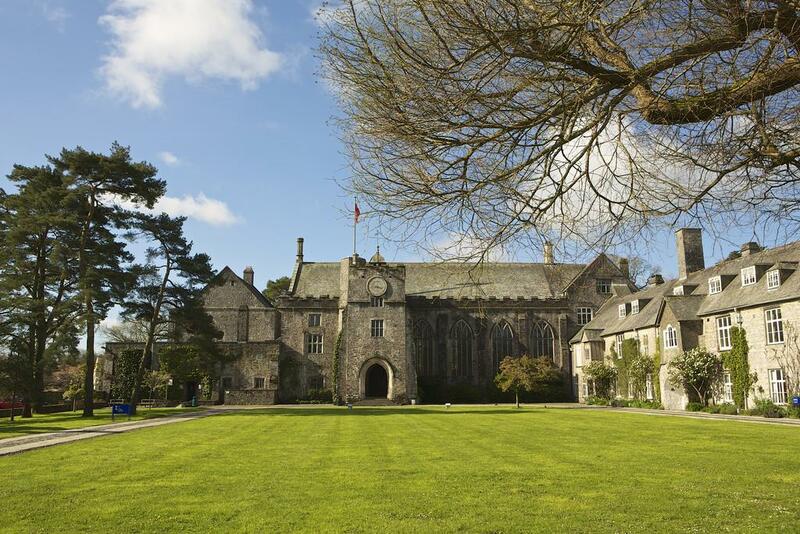 Dartington Hall is running a show offer of 10% off package prices for peak dates (Friday and Saturday) and 15% off package prices for off-peak dates (Sunday to Thursday). Goody bags will be available for couples that enquire on the day. Double A & The Bay is offering a 10% discount on the band’s full wedding package to brides, along with a stick of rock from their glorious home of Torbay. Enter Exclusive Yacht Wedding’s fantastic competition to win a wedding on board a yacht in Cyprus, complete with reception, worth more than £5,000. Harriet Lucille is giving away a free bridal experience package and is running an Instagram competition to win free prizes and treatments. On both days of the show she will be handing out goody bags with product samples, vouchers and Harriet Lucille accessories. Visit the Hart Photography stand and if you book during the show, you will receive a free wedding book upgrade. If you purchase or place on order with Hats2Go during the event, you will qualify for a 10% discount. Heavens Group is running a competition to win a giant illuminated love heart for your wedding day. The company is also offering full day hire of the heart for £149 on the day of the show, instead of £199. Receive 10% off the total price of your wedding stationery package when you order from Helena Willford by 30th October, and 5% off if you order by Christmas. Just Gin is hosting a competition to win a bottle of Dorset’s Conker Gin. Purchase a raffle ticket for £1 each; all proceeds will be donated to the Lyme Regis branch of the RNLI. Knots and Kisses is hosting a competition to Win Your Wedding Stationery, worth up to £500. The first 25 visitors each day will also receive a free goody bag. Benefit from a 10% discount on all KCB Images packages along with a £50 save the date deposit instead of the usual 25%. KCB Images will also refund your entrance fee to the show if you book them over the weekend. Kensa Boudoir is offering the chance to win a boudoir makeover experience. Visit the stand for more information and to book one of the company’s experiences at a fantastic rate. Lady’s Mile Holiday Park is running a competition to win a short break in one of its Luxury Lodges (subject to availability outside of peak season). The venue will also be offering couples who visit the stand a chance to book now for 2018 and pay 2017 prices. Place an order with Love & A Dress stand and receive a 15% show-exclusive discount, valid for three months. Book your wedding at Lupton House for January to March and receive a generous discount. NMC Photo Booths is offering a golden ticket to those who book during the show, entitling you to £50 off a photobooth booking. This means the usual £350 price for three hours’ hire will be reduced to £300. Enjoy a host of various special offers for when you book your wedding at Mercure Hotel Southgate in Exeter, such as complimentary bar tabs, canapés and much more. Meet the Party Lights team, discuss how they can make your venue look spectacular and enjoy a 10% discount. Posh Nosh is offering free canapés (subject to terms and conditions) to any bride or groom who books a winter wedding with the company – taking place between November 2018 and February 2019. Stephanie Snooks of Snooks Photography is running her best promotion to date; £150 off half day and £200 off a full day rate for weddings booked and deposits paid over the course of the wedding show. In addition, she is hosting a giveaway of 50% off her photography with a free engagement shoot on top to one lucky winning couple, with a further two couples winning a free engagement shoot. Susan’s Flower Shop is offering a 10% discount on the final balance of bookings made during the show. Win £150 off your venue dressing booking with The Devon Wedding Company. Five runners up will get £25 off vouchers for their venue dressing too. No purchase necessary. Winner to be announced on Monday 9th October via social media and will be contacted directly. Just fill in the competition form at the stand and post it through the competition postbox to be in with a chance of winning. The Ivory Secret is giving out vouchers to receive 10% off your wedding gown (valid on current collection orders placed before Saturday 30th December). There is also an accessory competition to win prizes of £75, £50 or £25 off their chosen accessory. Pay a visit to The Pretty Accessory stand and receive a 20% discount on table linen, table runners and chair sashes. The Well Dressed Cake is offering 10% off all its services exclusively to couples at Westpoint. Minimum spend £300. Truly Delightful Bridal is running a competition during the show to win a handmade customised garter for your wedding. Brides can also receive a free veil (up to £150 in value) on all dress orders placed during October 2017 (terms and conditions apply). Looking for gifts? Visit the Twinkle stand and you can pick up 10 bespoke gifts for the bridal party for £100. Normally only available online, Unique Planners by Pirongs will be selling its personalised wedding planners at a reduced price for the weekend only. Discount codes will be available for those who want to customise their planners online before they buy. Enter Wedprint Pro’s competition to win a free package for its personalised thank you cards or place a deposit to receive a huge 20% off your final package. West Country Wedding Planner is holding an offer on its 4ft steel vintage LOVE letters for £129 (for use within 30 minutes of Exeter). The incredible 6ft handcrafted paper flower wall from Wild Hive is making its debut at Bride: The Wedding Show and there is a 10% discount for the first 12 couples to book the wall. Wedding flower consultations booked at the show via Winsor Flower Studio will be entitled to 5% discount on their wedding flower orders. Visit the Woodbury Park stand, take a picture of yourselves with the Facebook frame and upload it onto Facebook, checking in at ‘Woodbury Park’ and liking the business page as well for the chance to win a spa Stay for four people. Woodbury Park is also hosting an offer of 10% off a 2018 wedding if you enquire during the show.